Care To Stay Home, a Spokane business owned by Rob and Jayne Fraser, provides a unique and individual commitment to each client. Through their initial intake to the oversight and ongoing management of each care plan, they are dedicated to serving their clients. Originally from California, the Frasers opened Care to Stay Home in Spokane in 2008. They provide a stable, loving service to assist the elderly with a wide range of non-medical services that are necessary to stay safely in their home. More and more, ageing parents electing to live independent, non-institutionalized lives, are receiving non-medical, in-home care services as their physical and cognitive capabilities diminish. Many aging adults may simply need companionship, an occasional reminder or light assistance here and there, especially after the loss of a spouse. Others may need total care. As hospital stays decrease, increasing numbers of patients need non-medical assistance allowing them the rest they need to fully recuperate when returning home. Most individuals diagnosed with a terminal illness on hospice services also would rather be at home, where they can receive compassion and maintain dignity during the last phase of life. Care To Stay Home can assist each client with a broad range of non-medical in-home care services to maintain the highest level of independent living and quality of life. In-home care is a range of non-medical, non-skilled, essential services to aging, recovering, disabled, chronically or terminally ill individuals who Care To Stay Home but need assistance with their personal activities of daily living. These Activities of Daily Living include items such as bathing, dressing, walking and personal care needs. In home care services also aide in supervision and assistance in order to remain independent, comfortable and safe at home. In-home care is appropriate whenever people Care To Stay Home but need ongoing assistance that cannot easily or effectively be provided solely by family and friends. For more information go to www.CaretoStayHomeSpokane.com. Care to Stay Home's offices are located at 12810 E. Nora Ave. Suite A-1 in Spokane Valley. The phone number is 509-340-1359 and the email is Rob@CareToStayHome.com. Spokane Public Radio has publicly launched its 'Moving to a Sound Future' capital campaign with a $5 million goal. With more than $3 million secure, SPR has $1.6 million remaining to complete state matching funds and begin the move to a new and improved broadcast home. SPR purchased the Fire Station No. 3 on N. Monroe Street at W. Sharp Avenue. The vintage Fire Station No. 3 is on the National Historic Register. The new facility will provide updated broadcast studios, new production facilities, and a state-of-the-art performing and recording studio to serve as a community hub for broadcasts, concerts, lectures, forums, debates and more. The building will double working space and triple SPR's production capacity. Upcoming events include public tours on May 10 from noon to 2pm, and a groundbreaking ceremony on June 2 at 1pm. RSVP at 509-328-5729 or 800-328-5729. More information about the project and the historic Fire Station No. 3 is available at spokanepublicradio.org/moving. Cornerstone Property Advisors has announced a new tenant for their Regal Center at 2718 E. 57th, bringing the retail center to 100% occupancy. Andrew & Emily Laughlin and Gabe West are opening CrossFit Expedition, a new fitness business. You can learn more at crossfitexpedition.com. The website isn't complete but there is some information available. Ben and Jerry's Free Cone Day is tomorrow! Let's all scream for ice cream! And here's a way you can feel good that the ice cream you're enjoying. Ben and Jerry's 35th annual Free Cone Day is this coming Tuesday, April 8 from noon to 8 pm at the scoop shop at RiverPark Square. Celebrity scoopers will be serving up all their great flavors including new Ben and Jerry's Cotton Candy and Salted Caramel Blondie to raise money for Honor Flight, whose mission is to transport Inland Northwest war veterans to Washington D.C to visit those memorials dedicated to honor their service and sacrifices. That's Free Ben and Jerry's this Tuesday from noon to 8 pm! Spokane Coeur d'Alene Living Magazine Release Parties get you behind the scenes in some of the coolest places in town! Unwind after work and check out the cutting edge of cancer treatment right here in Spokane, including the incredible CyberKnife cancer-fighting robot and Spokane Valley Cancer Center, 13424 E Mission, This Thursday, April 10 from 5:30 to 8:30. Meet some beautiful people, enjoy some wine, beer and awesome appetizers, art, and music. For more information go to bozzimediaevents.eventbrite.com. National CEO of Girl Scouts of the USA Anna Maria Chavez will be the keynote speaker at the annual Spokane Community Leadership luncheon event, Wednesday, April 16, hosted by the Girl Scouts of Eastern Washington and Northern Idaho (GSEWNI) and sponsored by Numerica Credit Union. The luncheon event will begin at noon, at the Spokane Convention Center located at 334 W Spokane Falls Blvd, Spokane. Anna Maria Chavez is a leader and role model for Girl Scouts across the country and around the globe. Lauded for her leadership, she has been listed among the 'Power and Influence Top 50' by the Non Profit Times, and has been recognized as one of the 100 women leaders in STEM (science, technology, engineering and math) by STEMconnector. A RSVP is required for all guests ASAP to events@gsewni.org or 800-827-9478, ext. 204. As a fundraising event, guest registration and attendance is a commitment to make a suggested minimum $100 donation per person to support Girl Scouting in the region. Visit www.gsewni.org to learn more about the Girl Scouts. 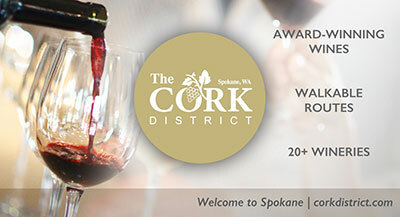 Inland NW Chapter of NAWBO (National Association of Women Business Owners) annual wine event, uncorked, will be held this Friday, April 11 at The Lincoln Center, 1316 N Lincoln. Time is from 6 to 9pm. 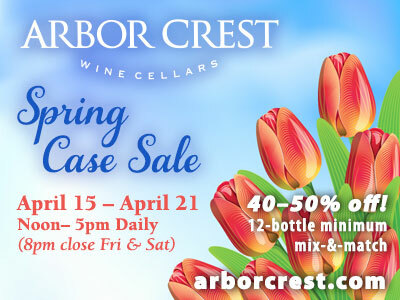 This fun event will include 5 Washington Wineries (Arbor Crest, Bergevin Land, Coeur d’Alene Cellars, Skylite Cellars and TERO Estates, plus Selkirk Abbey Brewery, and food pairings from Executive Chef Steve Jensen with Sommelier Ryan Biesen and Music from blues guitarist Cary Fly. There will be a silent auction of art, wine, treats, gift certificates, and much more. Tickets are $60 in advance or $75 at the door. For information and tickets, visit www.nawbonw.org/Event_Details.aspx?eid=161#RegisterHere. unCorked! is NAWBO's Only Fundraiser. Funds raised at this event will energize the local economy, provide education for local women business owners, support the Inland Northwest Chapter of NAWBO, and support Transitions, a Spokane based non-profit. For more information on NAWBO, visit their website at www.nawbo.org. Ferrante's Marketplace Cafe joins with the Ronald McDonald House of Charities of Spokane for the 4th Annual Ferrante's Adopt-A-Room fundraiser on Wednesday, April 16th and Thursday, April 17. All profits from restaurant purchases for dine in and take out, as well as from Ferrante's Gift shop purchases will benefit RMHC Spokane Adopt-A-Room program. Ferrante's is located at 4516 S Regal Street. The Adopt-A-Room program allows businesses and individuals to sponsor a guest room at RMHC Spokane, ensuring that families are able to stay at the House at no charge. Ronald McDonald House Charities of Spokane provides temporary lodging, comfort and support for families with children accessing medical services in Spokane, and supports related efforts to improve children's health in our region. For more information, visit rmhcspokane.org/adopt-a-room. The Greater Spokane Valley Chamber of Commerce will present the Empowerment Summit on Wednesday, April 23, at the Mirabeau Park Hotel from 7am to 2pm to empower individuals, employees, and businesses. The theme for the summit is 'Making a Difference' and will feature a panel of area leaders as well as local and internationally recognized authors and speakers. The event opens at 7am for check-in and a continental breakfast with exhibitors. The program will begin at 8am with an introduction 'The Importance of Empowerment' by Dr. Joe Albert, Gonzaga University. A panel segment will follow, titled 'Mentoring to Develop Skills and Work Values,' and will be facilitated by Eldonna Shaw, President & CEO of the Valley Chamber. It will consist of area leaders who have had success on the topic of empowering our young adults. For more information, visit the Valley Chamber's Facebook page, which includes a link to the registration page at www.spokanevalleychamber.org. Registration for the entire summit is $95 per attendee. Group discounts available. Members of the Valley Chamber are invited to secure exhibit space for $175. Women's Power Networking is a group of women professionals who support one another, have fun, and help their businesses grow by sharing contacts, providing referrals, knowledge, products and services. They host a 'FREE' monthly networking event, where the average attendance is 200+ women and a few brave men. The next event is 'Rap and Roll' Thursday, April 17, from 5-8 pm at Bumpers, 12828 E. Sprague Avenue in Spokane Valley. The event features Big Mumbo blues Band lead singer Jennifer Kemple, The Lilac City Roller Derby Girls, Women's Self-Defense Tips from Team Warhorse Karate, Mrs. Spokane Valley Stacey Benosek, door prizes including a lipolaser giveaway, and more. Admission is free but they ask that you support the restaurant host by purchasing food & drinks. For information contact 509-928-9664 or email nwfamilyfun@yahoo.com.